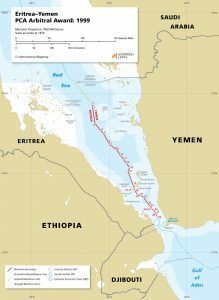 In 1996, Eritrea and Yemen signed an arbitration agreement which created an ad hoc Tribunal that was first asked to rule on the sovereignty of the islands in the southern Red Sea and then to delimit the Parties’ maritime boundary. In the first stage of the arbitration, Yemen was awarded sovereignty over the principal islands of Zuqar and the Hanish Group, while Eritrea was awarded sovereignty over the Haycock Islands and the Mohabbakah Islands. In the second stage of its deliberations, the Tribunal’s 1999 Award established the maritime boundary between the Parties.